Whoever thought you can use brochures to promote restaurants? We’re sure no one saw that coming. But in businesses, it’s always better to take one step ahead of the competition if you really want yours to succeed. 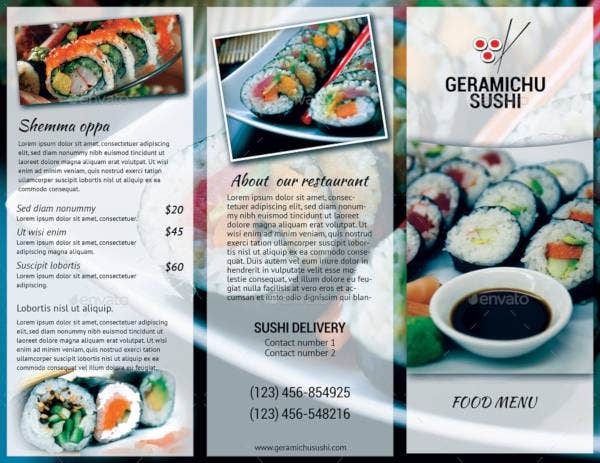 While most food service industries opt to use flyers to promote themselves, go for something more informative such as brochures. This way, you’ll be providing prospects with more than just a generalized view of your restaurant. You may also see Free Brochure Templates. 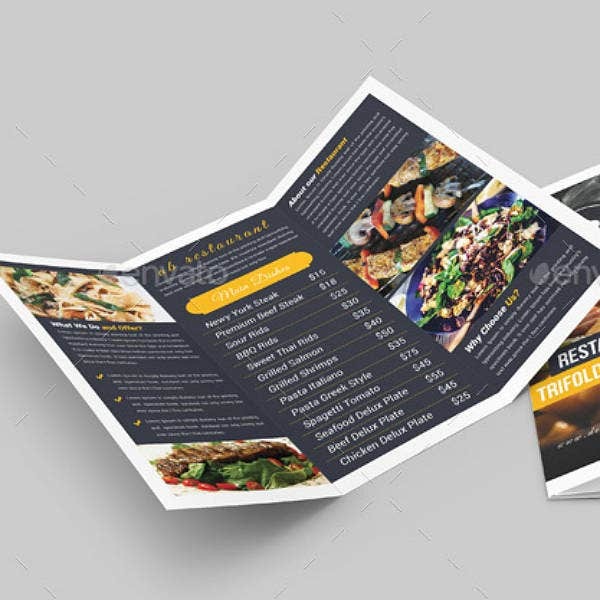 Below, we have an entire collection of restaurant tri-fold brochure templates for you to use and download if you’re interested. 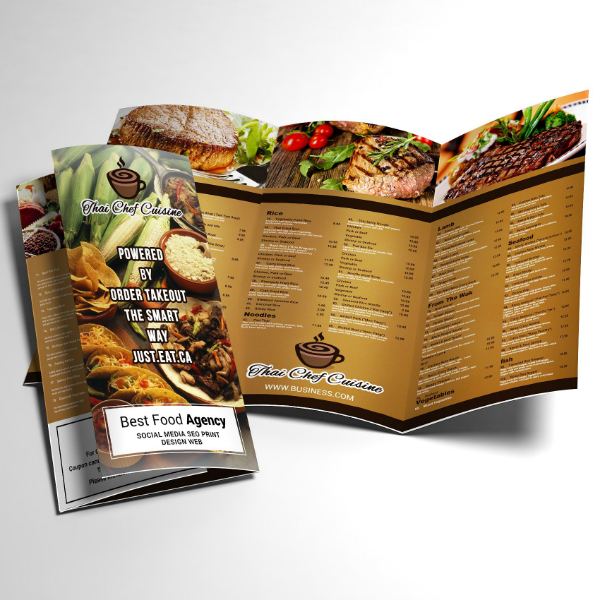 If you choose to use brochures instead of flyers, it’s just like sending or handing out menus to your prospects. 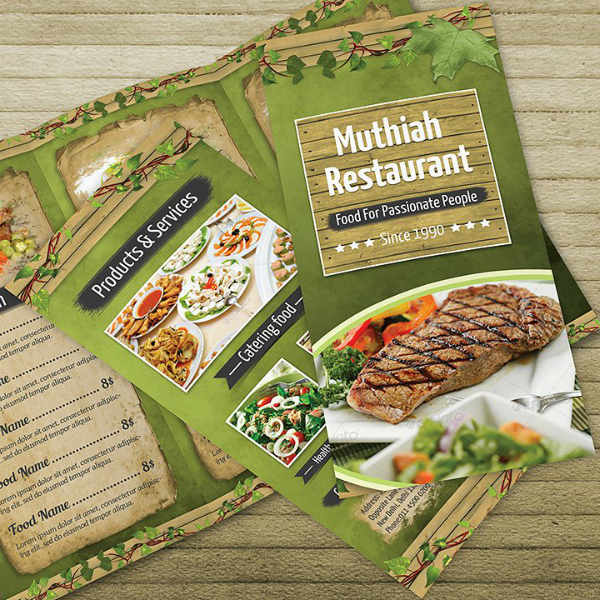 Brochures can help your leads know what dishes and beverages your restaurant is offering, leading to a higher conversion rate. 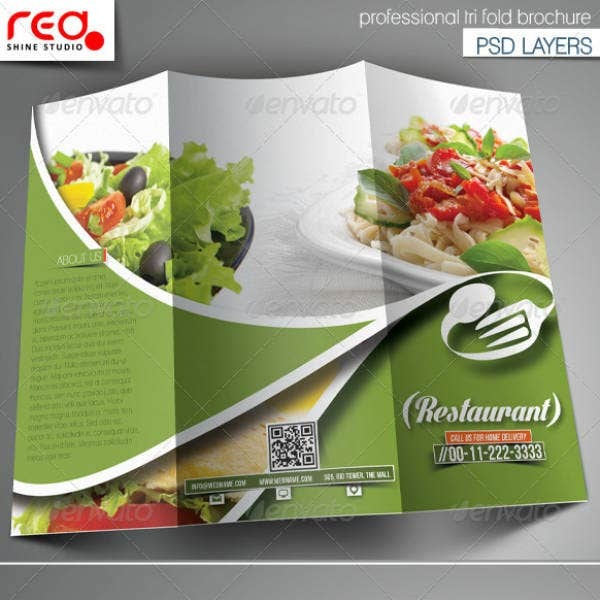 If you want to see the business brochure templates yourself, start scrolling down. Do you like to eat hamburgers just as much as you like making them? 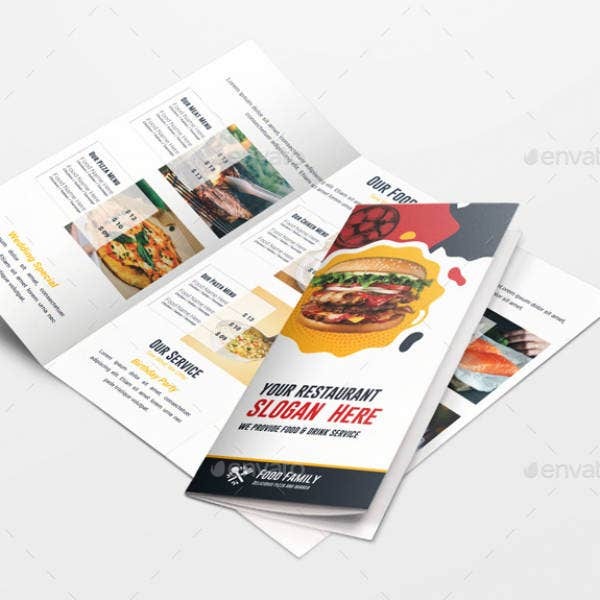 If you are passionate about hamburgers and want to share that passion with others, then you might want to put up a hamburger restaurant and use the tri-fold business template above to promote your business. Fun fact: Though considered as an American favorite, it didn’t actually catch on with Americans until the St. Louis World Fair in 1904, and was also referred to as “Liberty Sandwiches” during the 1st World War. Are you into Pad Thai? Or probably Khao Pad? If you have no idea what those are, they are actually some of the most popular Thai dishes. Thai cuisine is very well known for the spiciness, but aside from just being spicy, they balance it with sour, sweet, salty, and bitter flavors. 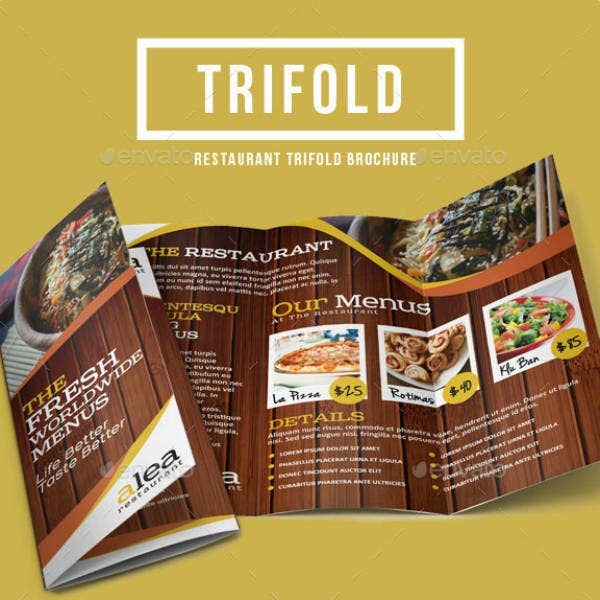 If ever you decide on opening your own Thai restaurant, then you might want to use the tri-fold food brochure template above for promoting your business. Many people dislike eating raw food because of some misconceptions surrounding it. But in reality, raw food is actually a lot healthier since they have not yet been processed in any way, but they have to be really fresh. Many Japanese food consist of raw seafood and are wrapped in seaweed together with some rice, fruits, and vegetables. In other words, these rolls are already a complete meal but are prepared in a rather unique and presentable way. 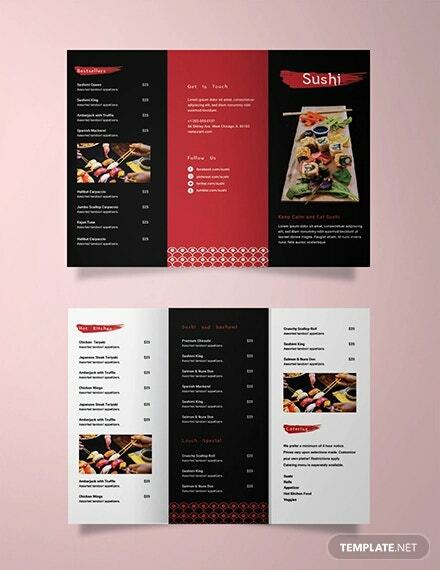 If you believe that you can make those people who dislike Japanese food change their minds with your dishes, then feel free to use the creative brochure template above to promote your restaurant. Always know your purpose for using brochures. 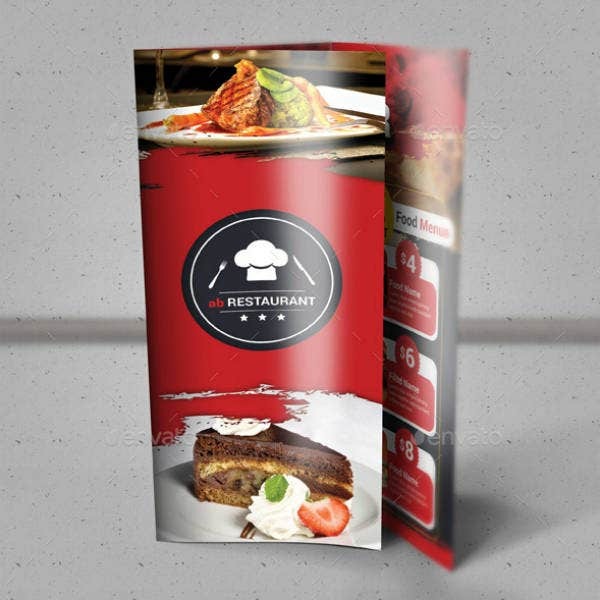 If you can determine the objectives behind why you chose to use brochures in the first place, this can help lead you to how you will design your brochure and what contents to include. When we say brochures, there are a lot of types or should we say, “folds”. 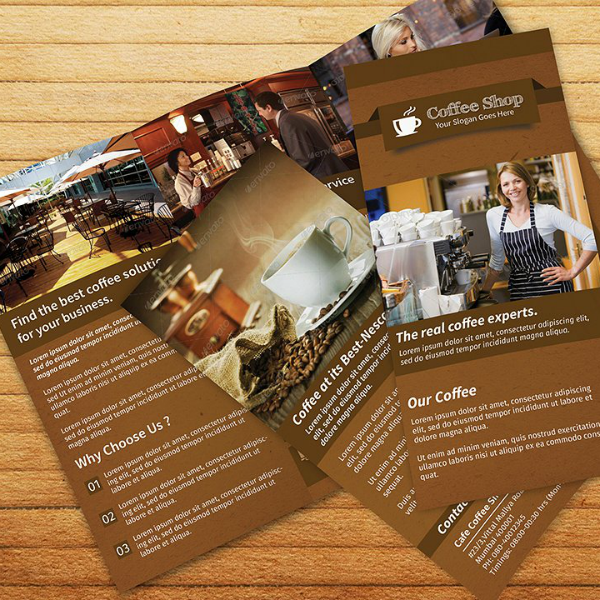 These folds depend on how much content you want to include on your brochure and how you want to present them. According to experts, the best number of fonts to use on a single design is only between two and three, don’t go beyond that. Using more than three types of fonts may result in your brochure design to look a little bit crowded, so choose your fonts wisely. 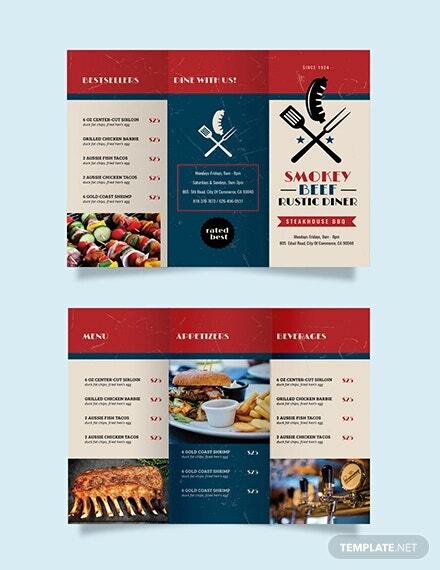 If you’re looking for a professional brochure template that’s highly versatile and can be used regardless of the type of cuisine, then the one above may be a very good choice. 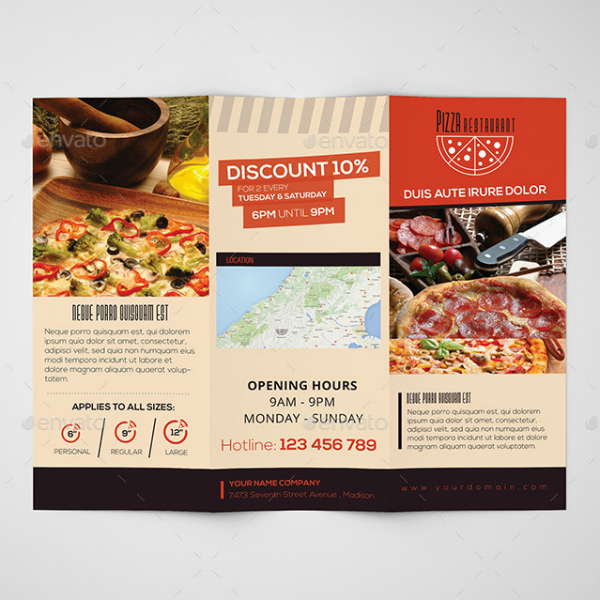 Whether you’re putting up and promoting a fast food joint, a coffee shop, or a formal-themed restaurant, this template will easily blend in with your theme, making it perfect for all occasions. 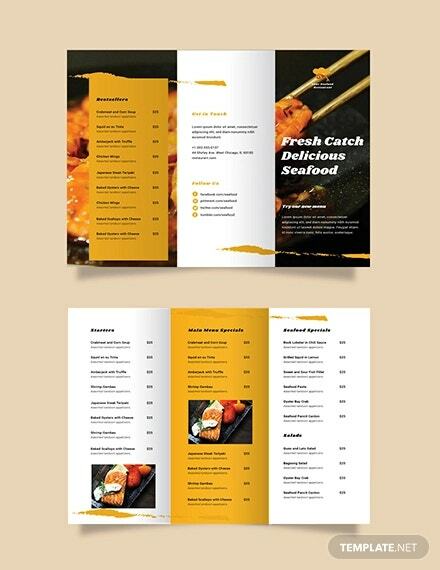 If you want clean and simple, then here is a perfect restaurant food brochure template that emphasizes its content over its creativity. The best thing about this is that it is highly versatile and can be used regardless of the type of restaurant that you will be managing. 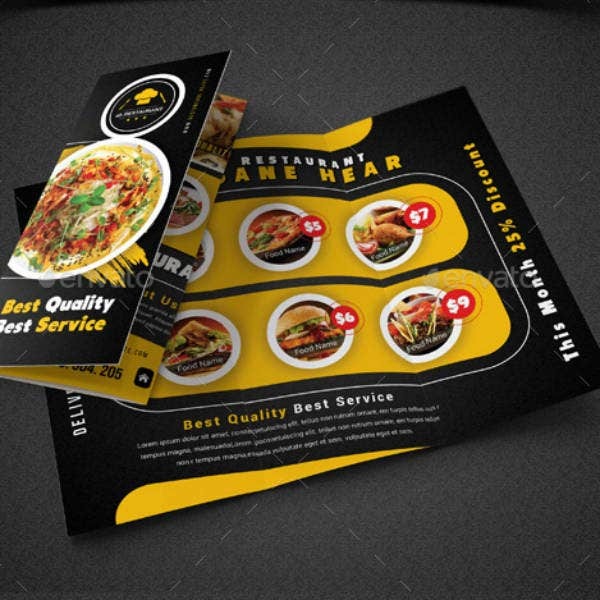 For the sample shown above, this template is being used to advertise fast food dishes, but you can actually use it for all sorts of food and beverages. 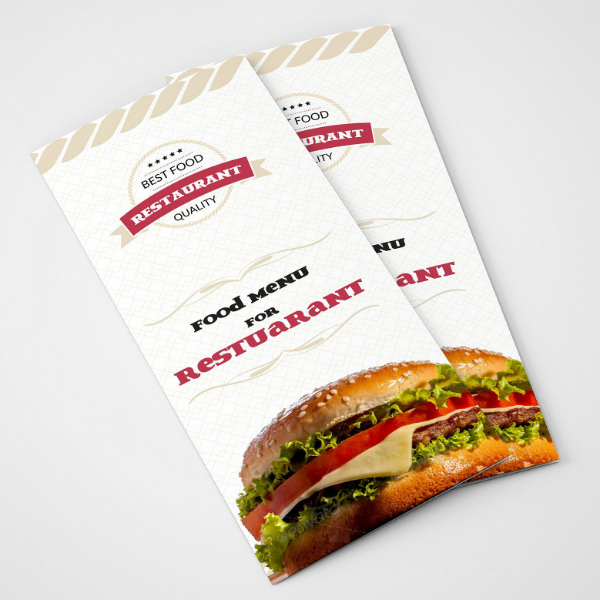 Did you like what you’ve seen from our collection of tri-fold restaurant templates? Every single one of these templates are sure to give you your money’s worth with their quality and functionality. For one thing, these templates were all created by professional graphic artists and were saved in high-quality formats. Aside from just being high-quality, these templates are also fully editable to allow you to customize them according to your preferences. 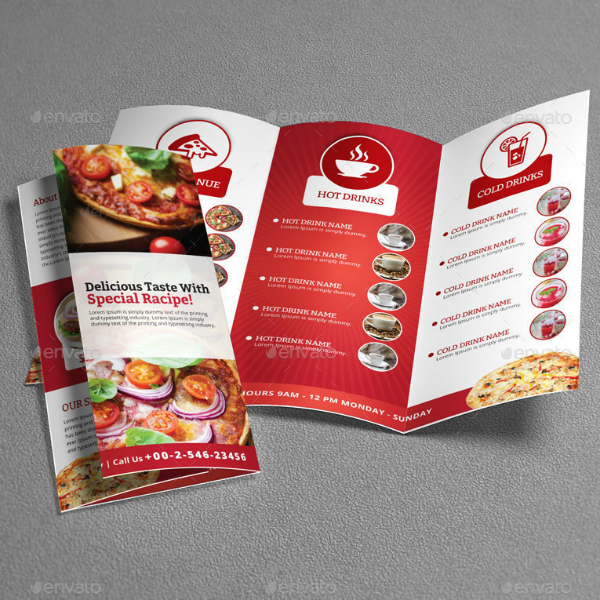 Let’s start with the process of looking for a brochure template that you think suits your purpose appropriately. If you are unsure which template to use from just looking at the thumbnails, you can actually check out some mock-ups or samples by clicking on the download button—don’t worry, the buttons will not download the template right away, they will only redirect you to another page. When you have found what you need, you can proceed to downloading the template by clicking on the download/buy now/purchase button provided on the page. Depending on the website, some require you to sign up before you can actually make your purchase while others simply allow you to download the template without having to register for an account. Just follow the instructions indicated and make the necessary payment to download the brochure template. Also, take into consideration the format of the template, make sure that you have the appropriate tool for editing it. Once you have downloaded the template, open the file on a graphics editing tool and make the necessary changes. The best thing about these templates is that they are fully editable, which allows you to make as much changes as you need without having to worry about the quality going bad. After editing the template, you mustn’t publish or have it printed yet, it is very important to proofread it first. Here, you will need to check every aspect of the design and content to see whether or not there are any errors. If there are, then go back to Step 4 and make the necessary changes, otherwise, proceed to the next step. The last thing that you will need to is to have your brochure design printed. If you choose to print your brochure yourself, make sure to use high quality stock and toner for highly vibrant and more durable brochures. However, if you don’t have the necessary resources, you can always have your design printed in printing companies. So how was that for easy to use brochure templates? We’re pretty sure that even those people who only know the basics of graphics editing and those businesses that are tight on the budget can enjoy these templates. 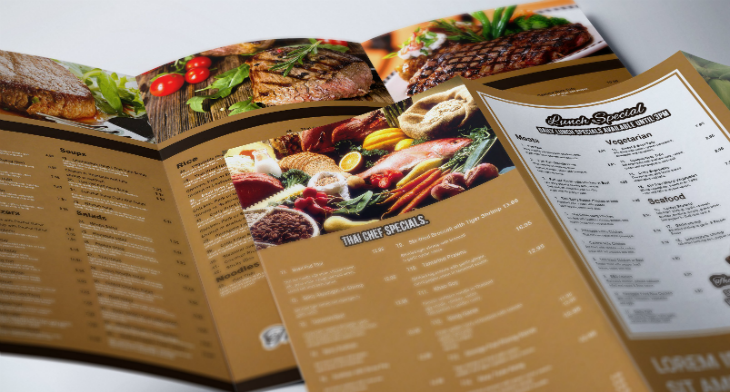 If you think our tri-fold brochure templates can serve you and your restaurant well, then start downloading one now.